There are several different colors, finishes, and sizes of the Apple Watch Series 4. There may be outward differences to the different metals, but what else separates the stainless steel vs aluminum models? AppleInsider spells them out to help you decide. 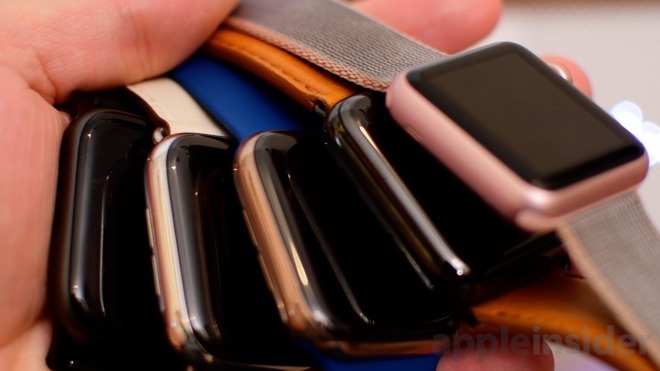 In total, there are 18 models of Apple Watch —gold, silver, and space grey/black models in 40mm and 44mm sizes either in cellular or GPS + Wi-Fi configurations. Other than the size, the finish and color option is one of the major choices that must be made when choosing which model to buy. Stainless steel is the more costly option, as well as the more flashy. All three colors have a pristine, glossy finish that is easy to catch the eye. These models weigh considerably more than the aluminum, easily appealing to those that like the fit and finish of traditional timepieces. With the glossy finish comes a downside —microabrasions. These tiny scratches show up on glossy stainless steel frequently and are most perceptible on the silver option. After using the silver for a year, many little scratches will be noticed all over the case. Apple uses a diamond-like coating on the Space Black version, making it the toughest of all three. After a year, we've noticed no microabrasions. Fingerprints also show easily on the stainless steel but can easily be buffed out for a pristine shine. The good news is that both these microabrasions and fingerprints are largely unnoticeable when worn on the wrist. Aside from the metal, stainless steel also utilizes sapphire crystal to cover the display which is extremely resistant to scratches. 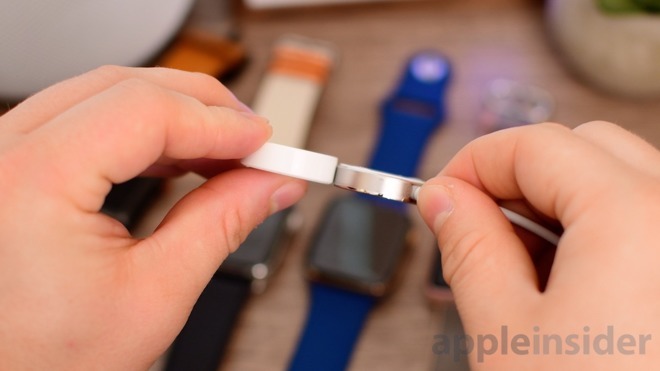 Bundled with each Apple Watch is a magnetic charging puck. Opting for the stainless steel model affords you a stainless steel covered charging puck. It has a glossy finish, a slightly heavier weight, and is slightly thinner than the common plastic version. Lastly, the stainless steel Apple Watch Series 4 is only available in cellular, as denoted by a subtle red ring around the Digital Crown. In short, when choosing stainless steel, you get a heavier, durable Apple Watch with a more premium charging cable, more resistant glass, and stunning glossy finishes. 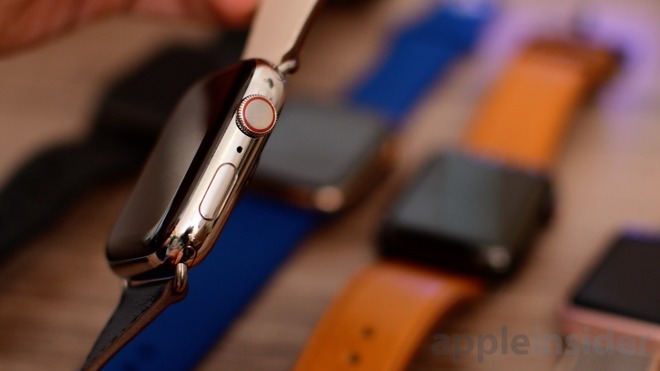 Aluminum Apple Watches are the far and away lighter than the steel. Those who frequently run may prefer the more lightweight load on their wrist. Instead of sapphire crystal, Apple uses Ion-X strengthened glass on the front of the display, which while lighter, is more susceptible to scratches. Lastly, Apple includes a thicker, plastic magnetic charging puck. In summary, aluminum gives you a lightweight watch with matte finishes that don't show small scratches but are less durable to big marks. A basic charger is included, and the display is covered in glass rather than sapphire. There are most configurations in the aluminum, with Wi-Fi + GPS and cellular versions available. I love wearing Apple Watch while working out or playing sports and want it as light as possible! I want the most expensive model available! Apple authorized resellers B&H Photo and Abt.com are currently accepting orders for the Apple Watch Series 4 in both stainless steel and aluminum. Abt.com will not collect sales tax on orders shipped outside Michigan, Illinois, Indiana and Wisconsin, while B&H will not collect sales tax on orders shipped outside New York and New Jersey*. 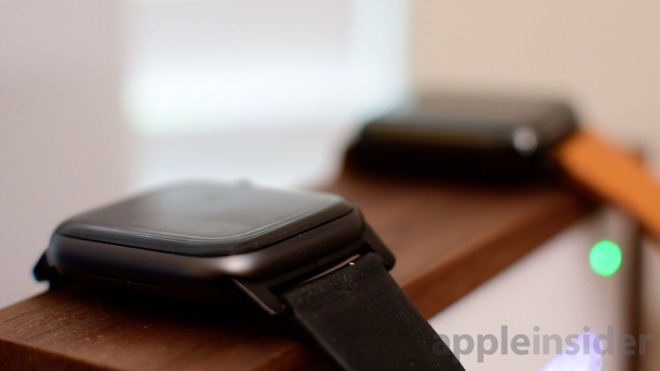 For a complete list of deals and product availability, please visit our Apple Watch Price Guide.